Panasonic will launch smartphones that sync with its household appliances, including its ovens and rice cookers, from this summer. The two new phones, which will be available under domestic operator NTT DoCoMo, are part of its Eluga line. 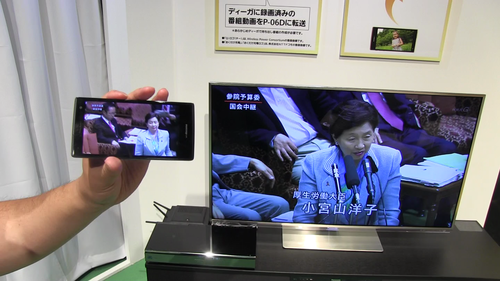 At a demonstration in Tokyo, the company showed how they can download recipes and beam cooking settings to appliances via their RFID chips, play video streamed from a digital recorder, and wirelessly send photos to TVs. With little to differentiate their Android-based smartphones or large screen TVs from those of competitors, electronics manufacturers like Panasonic and Sony are striving to create household ecosystems for their products, hoping interactive features between devices and appliances will lure consumers. Such companies have yet to establish industry standards, however, meaning little connectivity exists between different brands. Panasonic's new Eluga line of smartphones and tablets launched outside of Japan earlier this year, with a handset that went on sale in Europe. The device was the company's first phone sold abroad after the company withdrew in 2005 following years of losses abroad. The Japanese firm will sell a phone based on the European model, with a 4.6-inch screen. It will also launch a larger device, with a 5.0-inch screen and a quick charging feature that powers up half the battery in 30 minutes, as well as support for DoCoMo's high-speed LTE network. Both phones have 1.5GHz dual-core processors, 1GB of RAM and run Android 4.0. They are also water and dust resistant. The handsets also support Panasonic's wireless charging platform, which the company has built into some of its household appliances. One digital recorder, for example, charges phones that are laid on top of it. Wireless charging stations are also being made available for free charges at coffee shops and other locations in Japan, to drive adoption of the technology.